satisfied it by creating my own! I just wanted to mention a wonderful old shop I was introduced to by my partner, called W. Martyn of Muswell Hill. W. Martyn is a Tea and Coffee specialist store. 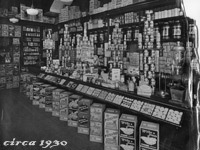 Set on a quaint old Victorian style shop floor, the store has been in the Martyn family since it began, back in 1897. They sell the most amazing selection of teas and coffees, pickles and jams, shortbreads, chocolates and many other tea and coffee acoutrements. As soon as you enter the store, you are hit with the most incredible aroma of freshly ground coffee. Just inside the window sits an old giant coffee roaster, which churns over and over, releasing wonderful aromas that would make your toes curl. I would highly recommend their Cuban coffee, as well as their Amaretto. To accompany this, I also purchased some clotted cream shortbread rounds. Four words: melt in the mouth. If you ever get the opportunity, please visit this store. If you are out of London, now you have a reason to visit! W. Martyn, 135 Muswell Hill Broadway, Muswell Hill, North London, N10 3RS.